This is the third game in the series based on the children's educational books by Joanna Cole and Bruce Degen. 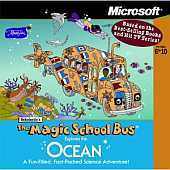 This game is based on The Magic School Bus on the Ocean Floor and the TV episode The Magic School Bus Gets Eaten. In this adventure, Ms. Frizzle and her class are headed to the ocean on a mission to explore zones and answer three clues that will lead to a sunken treasure. Traveling by submarine bus, the group will make stops at the Coral Reef, the Open Ocean, the Deep Ocean, the Hot Vents, the Kelp Forest, and more. At each stop the player can access activities, reports and experiments related to that zone by clicking on items nearby. There are also a number of zone-themed minigames that utilize both the mouse and the arrow keys. Among them are: Crab Chase - the player must click to move a crab around on the beach and collect food while avoiding a predatory seagull; Ride the Tide - the player helps a fish swim through the tidal changes by moving with the arrow keys and jumping over rocks with the space bar; Kelp Clean-Up - collect and bag up garbage while avoiding sharks; Food Chain Game - a jigsaw puzzle featuring colorful diatoms; Lantern Fish Game - the player must help a lantern fish gulp down its prey while moving through the ocean. There are two ways to move around; from the inside of the bus the player can click on the steering wheel and the gearshift, and while outside the bus he is able to scroll from screen to screen by selecting the arrows or clicking the submarine cursor. Zones may be visited in any order. Once the player has collected enough clues and travels to the area where the treasure is buried, he will find a treasure scanner to uncover it, and the game is won. The educational focus is on scientific exploration and experimentation, rather than simple fact-finding. This is the only game where the classroom can't be visited. Also, this is the first game that has activities to do in the back of the school bus and you can save the game in multiple files.